As a symbol for their unbreakable love, couples began attaching so called ‘love locks’ to the bridge Pont des Arts, in Paris. 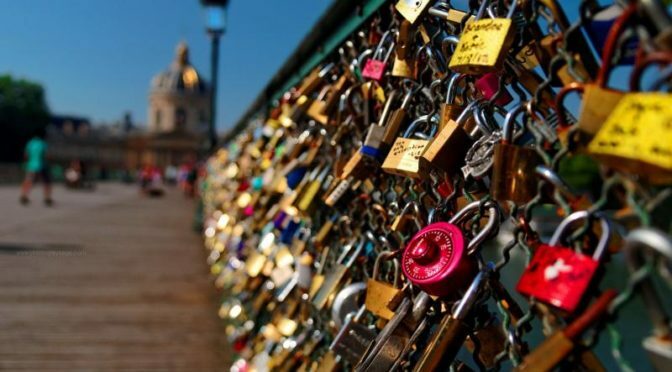 They would write their initials on the lock, fasten it to the railing, and throw the key into la Seine flowing underneath. Over time, the number of locks on the bridge became in the tens of thousands, with as many keys slowly dissolving at the bottom of the river. Last year, one of the railings couldn’t take it anymore. It collapsed. Parisians were outraged. Not only did this (primarily tourist) activity visually pollute their city, but it also contaminated their river, and wore down their cultural heritage. The city of Paris called in their structural engineers to investigate the failure. To little surprise they found that the total weight of the padlocks had not been anticipated at the design stage. The engineers came up with three solutions. One was to reinforce the structural integrity of the railing – to make it error proof and better able to accommodate the weight of the many locks. The second was to periodically cut away locks to keep the accumulated load within acceptable limits. The third solution was to replace every other meshed segment of the railing with glass – effectively making it impossible to attach any locks on those segments. 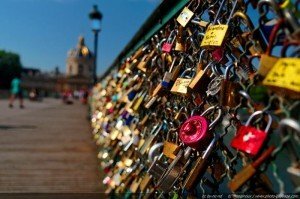 Had the city of Paris instead tasked psychologists with addressing this issue, chances are they would have developed a behavioural or value based solution – urging people to be mindful and respectful of such an iconic and valued asset as the Pont des arts – a psychological counter padlock of sort. And had they had anthropologists available to investigate the failure these would perhaps have highlighted how the love lock tradition did not at all emerge in Paris. In fact, this practice has been around for a long time in many European cities. For the tradition to emerge in Paris – the city of love – was perhaps just a matter of time. However, there was one aspect that was rarely discussed or investigated. A critical condition for this situation to unfold was that people believed a padlock was a good representation of love. Many people search and wait for a long time to find love. And many people have experienced the pain that comes from losing love or loved ones. Love, or that which we love, is indeed worthy of protective efforts. So it may make sense to think of a lock as a meaningful symbol. Things that we want to protect we like to keep safe, to lock away, to shield from outside influence, to build defences around that can withstand the tests of time. And in the same line of reasoning it of course makes sense to throw away the key so that no one can willingly break into this valuable asset. It would be nice if love was something you simply had, something you could control. And it would perhaps be comforting if there was a way to have love without the risk of losing it. However, love is not a commodity. Love is not a possession that you can have or not. Love is not something you can put a lock on. Nor is it something which is ever done or arrived. A love without risks is an impossibility. The padlock idea is confusing at best. In fact, to protect yourself of the potential negative side effects of love, deprives you of the very value you wanted to protect in the first place. When we shift our focus from what we want to protect to what we don’t want to happen to it, we become focused on failures. Soon, more and more efforts will go into trying to stay away from what is unwanted – and there is so much that can go wrong. Soon, duties, obligations and accountabilities will be established to achieve predictability and control. Over time, we begin to spend more time on preventing failures rather than fostering that which is helpful, nurturing, and/or enjoyable. This way, we forget to take care and to do the work of enabling love to grow and become the best it can be. This way, we become focused on the external, on targets and goals that must or must not happen. This way, we begin to err on the side of caution. When it comes to love, there is no guarantee. In fact, there is constant risk of losing that which was somewhat mysteriously given to you to care for. To love is about accepting and embracing that vulnerability (and risk), rather than pretending that you have arrived, or can arrive and be safe. It’s about going on an adventure with someone and continuing to learn and invest in that which helps both of you to rise with the occasions as they unfold. This way, love is not something you have, but something you continue to do. If you try to control your adventure it will soon turn into a negative and tedious undertaking. In fact, there is not much you can control in life. Not even your own heart. You are up against a challenging future that is largely unknown at this stage. But it’s a fair bet that there will be exhilarating heights, and things you’ve never seen or experienced before. There will also be boredom, a pretty face that doesn’t belong to your partner, and there will be valleys of despair. All these events will do things to your heart. It will speed up or down. It’s always changing. But in this mess you can still control what you give, and what you chose to receive. You may direct what your input to life is. You can give your time, your attention, your actions, your thoughts. And you can appreciate that which is given to you. This way you do what you can to make the relationship grow in the desired direction. The rest is not up to you. The best of adventures to you! Note: The above is an edited version of a speech I gave when my brother Samuel married his Sarah. Previous PostThinking differently about safety investigationsNext PostIs it 1947 yet? Thanks Daniel, nice read to start the morning with. Daniel, this was a really nice blog. I liked the message that avoidance is a strategy with diminishing returns. It makes us preoccupied with failure and can paradoxically cause the very thing we are trying to avoid. I am imagining a person so obsessed with holding onto a relationship that all their activities and efforts end up putting the other person off. In other words, it reinforces the age old strategy ‘playing hard to get’. Hi Daniel, having just returned from Paris from my honeymoon, I confess, I placed a padlock on a bridge! Sadly Pont des Arts was not an option since the balustrades have been replaced by artistically graffiti clad panels. However, your message about the fragilities and challenges of finding and maintaining love is powerful. Thanks for the light bulb!